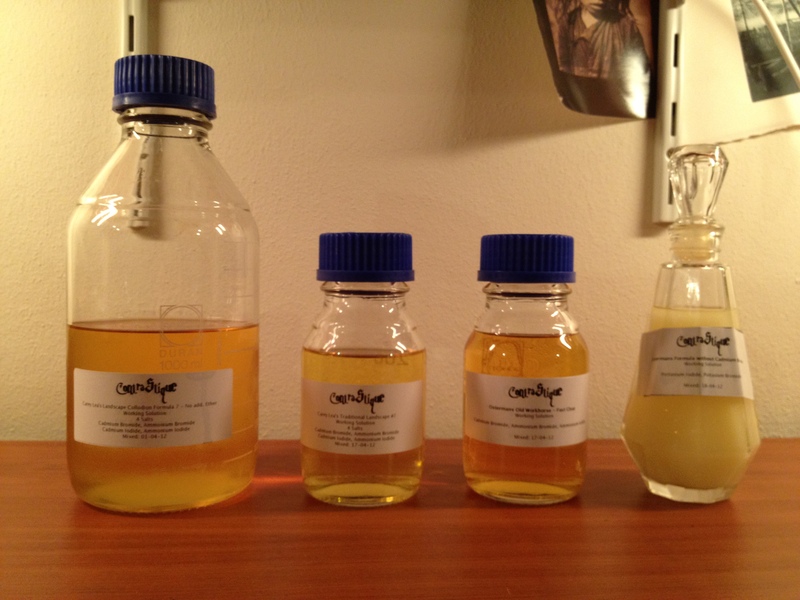 All Collodion Formulas Prepared – Ready for Testing! All I have to wait for is…time! Luckily I happen to have Friday and Saturday off (an unusual luxury) so I’ll probably get around testing the different formulas. I’ll describe all the formulas below. Now, that all sounds fantastic on its own but…the tricky part is, and probably the part where this test will fail beforehand is that all recipes need a matching developer and silver bath. I don’t have the time, and perhaps not even the interest, to try out all the possible combinations to find out which is the ultimate combo for each variation of collodion, developer and silver bath. Not to mention exterior factors that will have its impact on how it will all react; humidity, heat, just to name a few. So, this will not be a scientific test, merely for me to see what different formulas in my own setup will do. The ether less variation interests me but I know beforehand I will not be using this as my collodion formula in the future, read to many issues with that formula. Besides, ether less working collodion, what’s the point? There’s ether in the USP Collodion so why bother bringing in technical difficulties with little to nothing to gain. The version without Cadmium Bromide interests me because of well, it’s without the use of a cadmium salt. I know some people don’t want to work with the process or are reluctant to because of it. Would be nice to see how that works out. The one I’m interested in working with in the future is either Lea’s Traditional Landscape or Osterman’s Old Workhorse. We’ll see! Keep in mind that what I wrote in a previous post about the amount of alcohol in the developer is related to the age of the silver bath and so on…These are just standards to work from and adjusted when needed. Anyway, that was it so far… Have a great night! This entry was posted on April 18, 2012 by Contrastique. It was filed under Wet Plate Collodion-Process & Chemistry and was tagged with wet plate collodion. Indra, i have been using a non extra ether formula for already a few years now. It works like a charm without any problems. I remember that, yes. You encountered some problems in the beginning, like 2 years ago or so, but got it working for you. However, since I work outside in the field most of the time I have the least confidence in the etherless formula, regarding the things I’ve read and heard. Btw, your etherless formula is that the same as I mentioned above or do you use a different one? You are right Fabrice but this is the Fast Clear version which uses Ammonium Iodide instead of Potassium Iodide, as found on CWreenactors. I’ve tried this OWH fast clear before but it turned dark red immediatly after mixing (I used a iodizer solution) I put one or two drops of aceton and it turned back to yellow but it gave me a much more fragil emulsion. I didn’t have the OWH fast clear to turn dark red. It actually stayed nicely yellow. I keep mine in the fridge. I’m still discussing the formula with Mark but I had very little time the past few days. I might alter the next batch a little. I’ll get back on that asap ( I hope). It’a bit busy but I hope to refine the formula soon, also for use with negatives. its great to see you doing and posting your experimentations here. just wondering though, have you tried of using sodium instead of cadmium for the collodion solution? Thanks! I have never tried that and actually can’t recall any formula which uses Sodium Iodide Or Sodium Bromide. Do you mean Potassium? Cadmium waste disposal? You mean when you’re left with a batch of old collodion which you have to dispose of? I have never seen the results of a sodium formula combined with Waldeck’s developing formula. Do you know of any examples online? Personally, I’m not particularly interested in this formula because of its shelf life. I don’t have the luxury of being able to shoot collodion plates weekly due to time restraints so to have a collodion with a shelf life of just several weeks would lead to having to throw away a lot (or making a really small amount but even then). I order small quantities of ether, 1 liter at a time and when it arrives I immediately mix it with ethanol, 50-50. This is known to stabilize ether and keep it from forming peroxides, which is what makes it so combustible. Thank you! that helps tremendously! You’re absolutely right! I forgot the alcohol I used to mix the salts in…oops..it’s been rectified, thanks for noticing and notifying me! I am only just starting out, but going by all the comments on here I figured I would at least get a straight answer from you. I’ve managed to get my head around everything EXCEPT the collodion…every source I see it, it is listed as slightly different. I have seen it called “Collodion USP Plain”, “Collodion USP”, “Collodion” and “Flexible Collodion”. Basically what I want to know is what is the difference, which ones can I use and are they at all interchangeable? Also, I am in Australia so it is EXTREMELY difficult to get here! So yeah, any light you could shed on the matter would be much appreciated! “USP Collodion Plain” and “USP Collodion” is, as far as I know, the same. This USP version is what’s normally being used, either 4% or 6%, both are fine only require a different dilution. First see which one you can lay your hands on and then find out how much to dilute it. Don’t know this by heart as I normally only work with 4% which is the one available here in the Netherlands. “Flexible Collodion” is the one you should NOT be using. There’s camphor and castor oil in it which keeps the collodion flexible hence the name but makes it unsuitable for the Wet Plate Collodion process. If you have any more questions feel free to shoot! Btw.I’m about to receive a 6% Collodion in the next few weeks so I’ll have to look up the other dilution anyway. You can probably already find it on this forum. That makes things a million times simpler! Why no one has just written that anywhere is beyond me…. I’m trying to get together a small wet-plate studio in my New York apartment and have come to learn that storing ether in here could be a really bad idea. Given that the recipe contains significantly less ether, do you think that the Lea’s #7 Landscape recipe – without additional ether would be an answer to my problem? I know you mentioned that it can have issues, although I imagine that with a little experimentation they could be ironed out (I could see that your plate had streaks which could be attributed to not enough collodion in the solution). I applaud your study and will refer back to it in the future. Compliments for the good work, your blog is very useful! Thank you! I would like to ask a question, I tried this collodion: 2 grams of ammonium iodide, 1 gram of ammonium bromide, 100 ml alcohol 95° and 100 ml 5% collodion. The images appear (dirty), but just touch the plate and the image disappears, like dust… but the collodion is perfectly attached to the glass! as though the image were created over the layer of collodion… Is perhaps not possible to use only ammonium salts? Thank you first of all! To answer your questions… I never used a formula with two ammonium salts so I’m not sure what results they are meant to give. An ammonium salt is normally being added to the formula to let the collodion clear faster. However, it will give you a shorter shelf life. Cadmium gives you a longer shelf life that’s why I use that in my collodion. Ammonium caused stripes in my plates and I don’t care about the faster clearing so I don’t use any ammonium salts in my formula anymore. Not sure what causes the image to disappear when wiping over it, while leaving the collodion layer intact though. I never had any of those issues. The dirty appearance of the images could be you’re not cleaning your plates well enough. It could be your silver bath is dirty. You can try and pour a plate, pretend to expose it and develop, stop and fix it. If it gives you a proper evenly black plate (which it should be with no exposure), you pretty much know your chemistry is fine. If it doesn’t then you need to locate where the problem is. How did you make your silver nitrate? 90 grams of silver nitrate to 1 liter of distilled water? No further ingredients? Did you measure its specific gravity? Is it around 1,07? Did you measure its acidity? Is it around 4-5? How long do you leave your plate to sit in the silver nitrate bath before exposing it? With what product do you clean your plates? Which version of collodion do you use? Plain USP Collodion? Maybe you should make a new batch of a formula that has been used and positively tested by a broad range of wetplaters. How old is your collodion? Which developer do you use? How long do you develop the plate? How do you develop the plate? By pouring a lot over the plate or only a small amount like a little more than needed? Do you have images of your dirty plates? Anyway, lots to check! If you have more questions or would like to answer a couple of the above I’d have a better idea of your working routine. Hello, many thanks for the reply. So, the nitrate of silver is a bit ‘used, but I do not think dirty, I should, however, measure the density of it, the plate is sensitized for 3 minutes, the acidity is around 5, I clean the dishes with alcohol, i do not have calcium carbonate at the time, and the collodion is usp (non-elastic). The development is sulphate of iron, more or less the recipe Scully & Ostermans Formula with a teaspoon of sugar. Hereinafter two plate: a left collodion with potassium salts, about a week old, and right collodion with ammonium salts, the same age … I touched on this plate with the hand the entire surface except for a small square in the center. 25 sec exposure. artificial light. Simply scanning the negatives and then reversed. I also wanted to ask you, have you ever had white shiny patches due to the varnish? Those plates don’t look good indeed. Best is to measure the bath prior to using it so you know the “basis” values of the bath, thus when you measure it after having used it you know how it got altered and that tells you how to bring it back to its “original” state. The acidity can vary as distilled water does not have a standard pH value. But around 5 is fine. You can place the bottle in the sun or daylight with the lid open to let any contamination sink to the bottom. You can’t see the contamination until you do this. Also this helps evaporating alcohol and ether residue from your bath. Cleaning the plates with alcohol alone is not enough. You can check this by breathing onto your plate after you’ve cleaned it. If it doesn’t dry up in one smooth motion the plate is not cleaned properly. The collodion you’re using sounds like the right thing. I have never had white shiny patches due to the varnish..Have you filtered your varnish before using it? I will try as soon as possible. Many thanks, best regards. I am making my own collodian, and have been offered 1/2 second and 1/4 second nitrocellulose, does any one know or have made their own, can shed light. i think the chemist said, 1/4 sec was the same exept twice as condenced, so theoretically only need half as much, but any way, just trying to find out before i commit. I made poor boy collodion. I think its your “Nr 5 Scully & Osterman’s Formula without Cadmium Bromide”. A part: Alcohol+collodion, B part: dest. water+Potassium Bromide+Potassium Iodide (John Coffer receipt, no ether). When I mixing the two part, the solution was white. Precipitated very fine crystal and 12 hours later its sat on the bottom of glass. Its good? The white precipitate will dissolve after a week? I do not move or shake it at times? How do you used that? Cadmium Bromide helps to shorten the clearing time. I left the solution to clear for over a week (if I recall correctly) and when I started doing the test the solution had not cleared at all. After a week (or so) salts sank to the bottom of the glass and I decanted the solution and used it as is. To my surprise it did work and did a pretty good job. The thing that I was supposed to do before mixing the two parts together was to first dissolve the salts in (warm) water. They have a hard time dissolving in alcohol. I’d try that next time. I NEVER shake the collodion. I normally do filter the solution and leave it to rest for at least a day after. I think you’re referring to this formula? all of formulas for positive Collodion photography? what difference positive collodion with negative? What I believe to be the main difference is that a negative formula is meant to gain higher density on a plate. These negatives are then better suitable for printing with alternative (contact) printing methods. Extending exposure time compared to a exposing a positive plate is also used for this purpose as well as choosing a different developer and or in combination with various re-development techniques. I’ve been using Quinn’s collodion recipe, and a variation of Scully & Ostermans Developer with reasonable success. a couple of days ago, I spoke with a gentleman who I think was using John Coffer’s collodion recipe and reported that his exposure times were often around 3 minutes, whereas mine are at most 30 seconds, that I’m trying to understand is why his would be so long as compared to mine, he said it was at the time all relatively new collodion etc. Not sure to be honest. Perhaps he used different lights? Different lens with a smaller max. aperture? Maybe he didn’t dissolve the salts in the collodion properly before mixing it together and loses speed because of that? I left a comment before. Ok o yrsterday I mixed a batch of Old Reliable without ether and brand new chemcais. The collodion cleared within minutes. So today Mixed up another batch of Old Reliable, same ingredients except I multuplied the ingredients x4 to end up wuth roughly 1000mL ol the same fomrula…. for some reason this forumla is not clearing fast a ll. I mixed it about 10am this morning, nearly 12 hours ago and it has barely cleared… do you think it because of the volume that it has no cleared or do you think there are other factors at play here? I really do not want to throw away so much volume of such expensive chemicas…. as they are expensive here. do you think it m may just take a longer time to clear? THe chemicals were from the same batches and everything…. I don’t quite understand why they have not cleared barely at all… the volumes were the same….. help!